It’s not the most exciting part of your day, is it? Getting from point A to point B.
It’s the part where you get lost in thought and start to wonder in the dreamland. And why wouldn’t your mind be in a state like that? You know every turn, stop, and building on the way and let your autopilot mode take over. I used to be like that myself. I couldn’t walk out of the house without putting on the headphones so that I could listen to music or an audiobook. It felt as if I couldn’t be alone with my thoughts. I always needed something to shut out the “noise” of constant thinking and worrying about all the things. 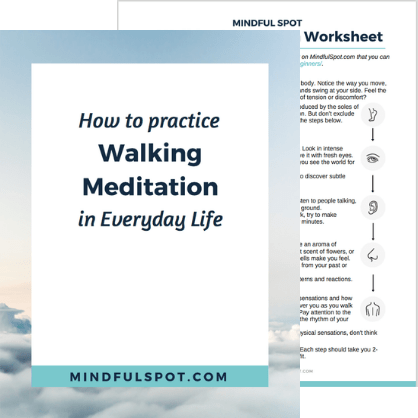 But here’s what I discovered after I started meditating on a regular basis: this boring route you take every day can turn into a simple and powerful walking meditation practice. Well, I have good news for you: now you have time to meditate every day. You can practice walking meditation wherever you go: office, supermarket, coffee shop, restaurant, you name it. Every step becomes an opportunity to be mindful. Just like in breathing mediation you’ll need a point of concentration to keep you grounded in the present moment. For this purpose, you can use the sensation produced by the soles of your feet touching the ground. Come back to it whenever you notice your mind has wandered off. But you don’t have to exclude everything else. On the contrary, you need to pay attention to your surroundings by following the steps below. Also, remember to walk naturally, but at a slightly slower pace than usual. As you walk, begin by directing your attention into the body. Notice the way you move, how you put one foot in front of the other, how your hands swing at your side. Feel the weight of your body as you walk. Are there any areas of tension or discomfort? Pay attention to the pace and rhythm just like you do with your breath during sitting meditation. Observe the way you look around or prefer to keep your head down as you walk. Can you explain why do one or the other? These habitual patterns can reveal your state of mind. Now make a conscious effort to notice surrounding objects. Look in intense awareness at everything around you and try to perceive it with fresh eyes. You’ve got so accustomed to your route that all you see is mental labels devoid of life and depth. For a few minutes, try to drop the labels and imagine you see the world for the first time. When you make this simple shift, you may notice that people and things around you seem different. You’ll start to notice subtle nuances never seen before, and your route will become fresh and new. Then turn your attention to the sounds around you. Listen to people talking, cars passing by or the sound of your feet touching the ground. Likewise, pay attention to smells. It could be an aroma of ground up beans from a nearby coffee shop, the sweet scent of flowers, or the smell of freshly baked bread. Notice how these smells make you feel. Do any of these experiences evoke certain memories from your past or hopes for a distant future? As always, use this part to notice your habitual thought patterns and reactions. The next step is to turn your attention to any physical sensations and how they make you feel. Notice a fresh breeze sweeping over you as you walk down the street and the warm sunshine on your skin. Pay attention to the way you walk, how your feet touch the ground, and the rhythm of your steps. Are you moving fast or strolling while enjoying everything around you? When you notice any pleasant or unpleasant physical sensations, don’t think about them. Just acknowledge them and let them be. At some point, you’ve lost the ability to be aware while taking familiar paths of everyday life. The time spent going from one place to another is seen as meaningless and unproductive. It’s something you have to do. You always feel the need to be somewhere else, get to the destination quicker no matter what. Why not stop this unhealthy tendency and practice walking meditation whenever you can. Make a conscious choice to take off your headphones for 10 minutes and practice steps described above. This practice will complement your daily sitting meditation and help you make faster progress towards more mindful and stress-free life. Download the free worksheet below and get started today.